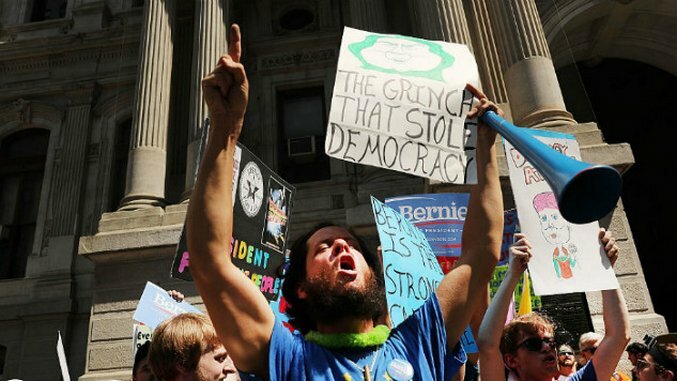 Day three of the Democratic National Convention in Philadelphia saw the continuation of the protesting which had been taking place all week from supporters of Sen. Bernie Sanders. Though boos and jeers in the convention hall were not up to Monday’s or even Tuesday’s standards, they were nonetheless present—as President Barack Obama found out as he delivered his address in support of nominee Hillary Clinton. That said, by and large, the crowd seemed fairly excited, as if the previous two days did not have historic demonstrations against the party leadership and the nominee. A casual observer might not have thought much about the intermittent protestations. By and large, in spite of Tuesday’s walkout and protests outside the convention center, the arena was packed. But after speaking with multiple Bernie delegates, there was something seriously wrong. Another delegate even showed me a text message their delegation had received the day before from the DNC, requesting help to fill in obviously empty seats in the California section, following the walkout, in order to keep up appearances. In other words, there is a serious unity problem, and the Democratic establishment knows it—it just does not seem to care. If Democrats were as concerned with party unity as their slogan, “Stronger Together,” would suggest, you wouldn’t know it being at the convention yesterday. And that is just the tip of the iceberg. Though most of the speakers at the convention praised Bernie Sanders, the DNC reportedly removed progressive former Democratic Ohio state senator Nina Turner from the agenda without providing a reason. Over the course of the primary, Turner found national prominence as a surrogate for the Vermont Senator, playing the role of ambassador for non-white voters. She respect and adoration of the Sanders movement for her unabashed progressivism and loyalty. For the Democrats to make the decision to cut her sent a clear message to Sanders supporters. As if that scheduling change wasn’t tough enough for progressives to swallow, controversial former New York City mayor, Michael Bloomberg, remained on the schedule. Bloomberg, a longtime ally of Hillary Clinton, earned a reputation as persona non grata among progressives when he used the NYPD to evict and disperse the Occupy Wall Street movement, all the while blocking the public and press from reporting it. The violence that resulted—the brutality against the demonstrators—has haunted his legacy ever since. Outside the pavilion, more Bernie delegates gathered and chanted, “Hey hey, DNC, this is not unity!” I consider this a fair assessment. The party is not now unified, and will likely remain that way unless something changes. Of course, with this chant comes a hope that all is not yet lost. The continued presence of the Sanders delegates at the convention—well, most of them (many have not returned)—is a hopeful sign for the party, as is the chant which implies a desire to come together. However, time is quickly running out for the DNC to make the necessary concessions. 1) Apologize for the culture of bias against Sen. Bernie Sanders that was revealed to have existed at the highest levels within the DNC—the discovery of which prompted DNC chair Debbie Wasserman Schultz to resign. What’s more, the scent of impropriety still hangs in the air. Though she stepped down ignominiously, Schultz ended up hired as the honorary chair to Hillary Clinton’s 50 State program to elect Democrats nationwide. The top DNC officials who sent and received the scandalous, pro-Clinton emails promptly issued apologies, but faced no other consequences. According to the protesting delegates, that must change for unity in the fall. 2) Amend the platform to utterly and expressly condemn the Trans-Pacific Partnership trade agreement. The defeat of a measure to do just that by Clinton’s platform appointees has hung over the nominee in spite of her publicly denouncing the deal. If amends are to be made between the two camps, tougher language must be adopted. The good news is, a significant number of Democrats from both camps, agree on this issue. There is very little risk involved in staking out, once and for all, this position, and so much to lose without doing so. 3) It must allow progressives to speak. The Nina Turner incident only served to heighten tensions between the party leaders and the Sanders supporters. 4) It must open its doors—literally. Thousands of disaffected Sanders supporters are demonstrating throughout the city. If the Democratic leadership were shrewd, it would extend the olive branch by allowing the protesters onto the convention grounds, and providing water. A frequent complaint I heard from protesters outside the DNC was that the dual layer of fencing around the convention center as well as FDR Park was unwelcoming. “They want to keep us out,” cried a protester wearing a vest covered in a plethora of Bernie Sanders pins. Of course, another option would be Hillary Clinton personally addressing the crowd—again bringing water. If the Democratic Party believes its message of unity as much as its politicians claim it does, there is it must meet these protesters half way. Progressives are becoming the most important voting bloc in the United States because they are the majority of millennials. These voters are looking for reasons to vote Democrat, and prevent Donald Trump from winning the presidency. They just need an olive branch. Yet Hillary Clinton and the Democratic establishment seem set increasing appeals to centrists and disaffected conservatives alienated by Donald Trump. Those priorities were on display yesterday at the convention as the DNC filled seats and fretted over appearances, but made no efforts at ameliorating the situation driving the protests. This strategy is only making things worse. From what I have gathered from the Sanders delegates, something is being planned for tonight when Hillary Clinton formally accepts the nomination. If ever there were a point of no return for party unity, this is it. This is the DNC’s last chance to bring the party together.